Next prominent university city up was lovely Cambridge. One can really just notice on the street how focused people are here. And science is what everybody speaks about, which means a perfect fit for science games! The Chemistry department, Biochemistry department and Plant biology can look forward to get The Art of Science as a prize at their Christmas parties. Several colleges can enjoy our challenging science quiz in their common rooms. The Science museum now sell it and of course also England’s most famous bookstore for academics, Heffers. 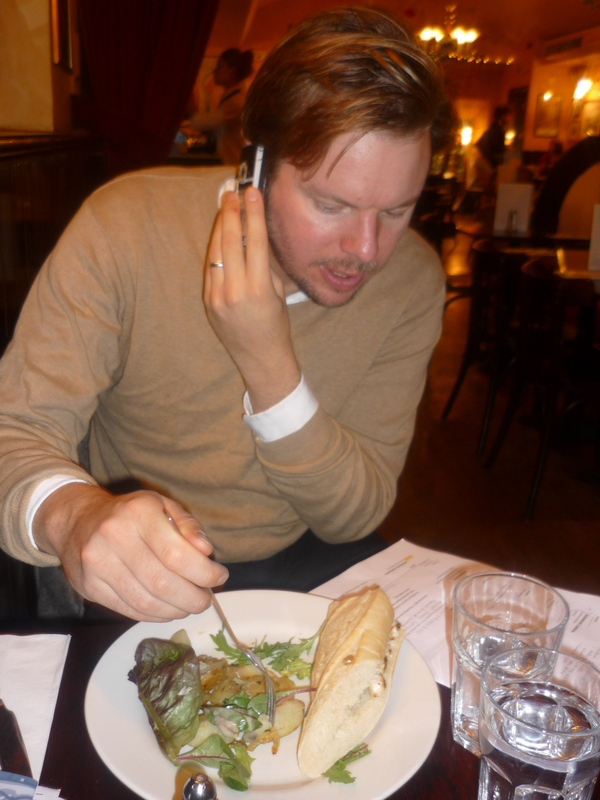 Evening session – pub crawling as usual. Already quite a few pubs in town have The Art of Science and fans can play the game at “The Kings Arms”, “The Elm Tree” and “The Emperor”. Bar owners report about frequent game nights and that The Art of Science is very appreciated. Now also THE pub “The Eagle”, “where the DNA was “invented” has the game that we invented. Thank you Gamebridge! It’s really been an adventurous and exciting road trip through academic England and we sincerely hope that we have brought some science game spirit to the British! Thank you for this time! 4. Claudia and The Art of Science are ahead of time! Bristol pubs we like. They also seem to like The Art of Science. The Robin Hood, The White Bear, are the most famous, but also several more now hold our games. For those who happen to be in Bristol to try over a beer or two. We also had the opportunity to try their beers, and what can we say, drinking beer in England just IS so much more cultural then doing the same in Sweden…! Tuesday morning, after a short visit to “@ Bristol” science museum, heading east again towards Reading. At first we found a really nice old English style university campus, but without students. After much walking and lots of guessing we learned that this campus actually was under construction. They had moved all students to another campus, their bastards. Off we went and there they were, hipes of them! Blackwells in the student union building already sell the game so together we made a campaign giving out flyers to a huge amount of people and showing the game in the entrance of the shop. The campaign will continue there until Christmas for those who missed us. As a science student at Reading University I don’t think you can have missed that we exist though. A storage hall full of Christmas presents! We can tell you that Santa Claus gets a lot of support from the people in Swindon. On this year’s list of Christmas gifts is definitely: The Art of Science! Since today, Claudia and Björn tour through Southern England. 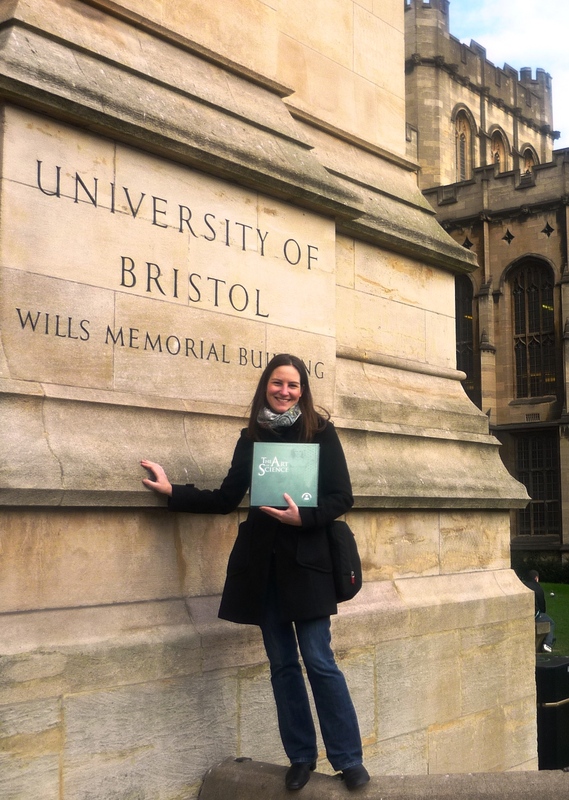 They started in Bristol and the tour continues to Reading, Cambridge, and Oxford. In Bristol students are still busy with their lectures and exams and a lot is going on at the university. Claudia enjoys the fairly moderate temperatures after arriving from snowy Sweden. The last colourful leaves on the trees are soon to fall off. Only the Christmas decoration in the streets and our promotion code for The Art of Science on the posters reminds one that it is Christmas in four weeks. 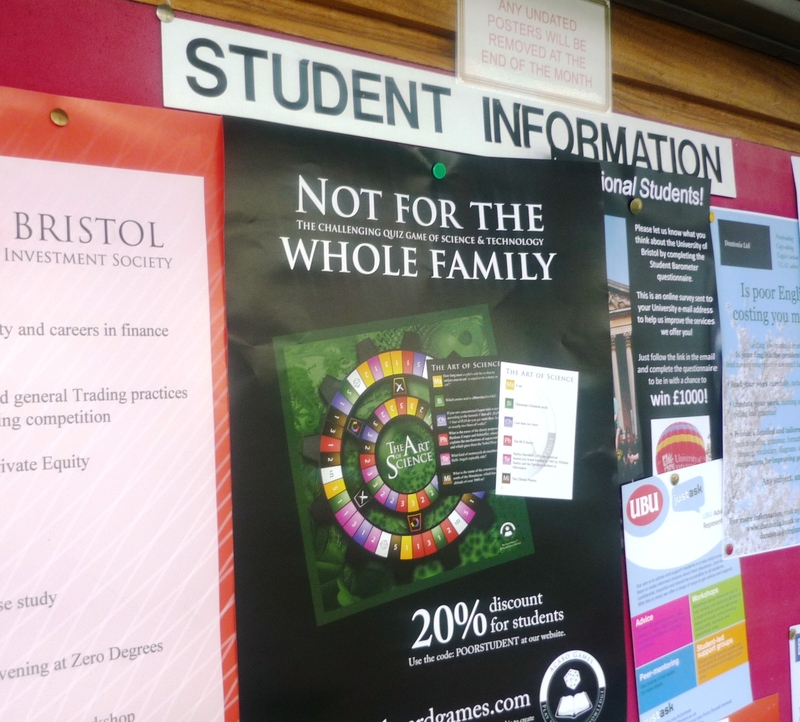 We met many students from the Math department, Biological sciences and Engineering, and several tell us enthusiastically about fun knowledge game evenings in the local pubs of Bristol. But whoever is lucky can win our game at the Student Union Christmas Party! On the promotion tour through the bookstores and game stores the nicest contact of the day was Kerstin, a woman who comes originally from Gothenburg, Sweden at Playful. So, first of all I’ve basically tried to contact all suitable book and gift chains this week. Got some very positive response, but frustrating enough the chains are so slow in their decision making and evaluation! 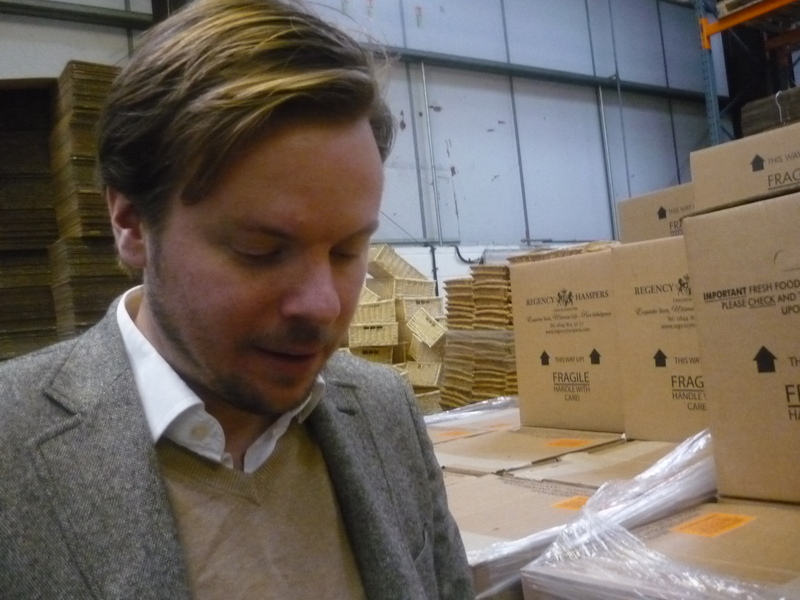 But just now a manager asked me for the price of 3000 copies(!) I don’t want to say anything before anything is settled, but it’s certainly a good opportunity to spread our game throughout the UK, haha. There is only one hatch, and that is that with such a good trade price they can get for this many copies, they will probably offer the game at a cheaper price than us and other small shops that now hold the game, which will not be appreciated. 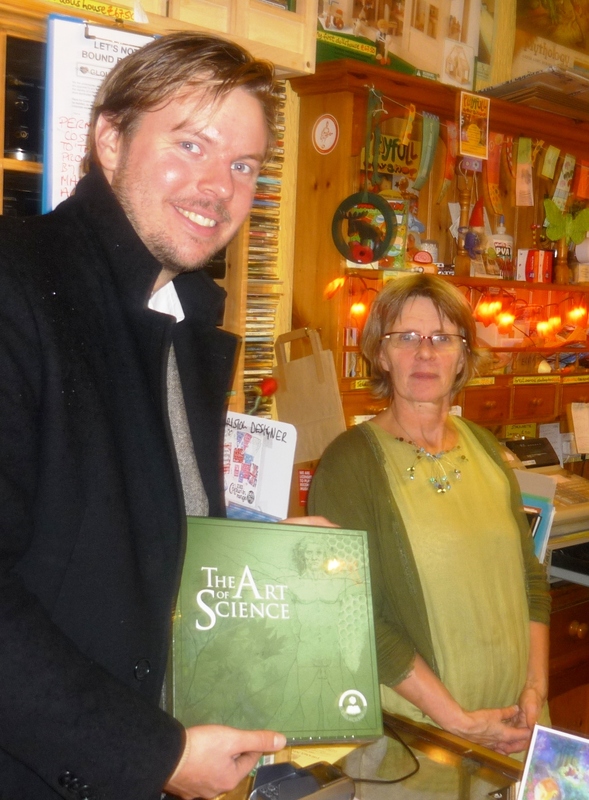 Popular Science UK, Gift Review – The Art of Science , by Brian Clegg, popular science author and reviewer. 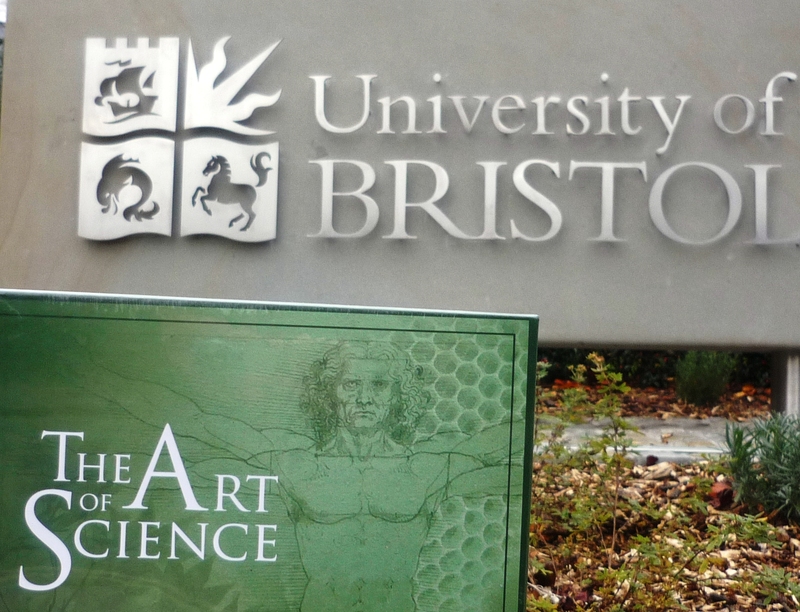 BenchTwentyOne,The Art of Science – a review of the new boardgame and an amusingly budget video taster, by PhD Chemist and Science writer Joshua Howgego, who we met in Bristol last week. He also published a very nice article in the Bristol university paper “Epigram”, but I haven’t got hold of the web version yet so can’t display it here..